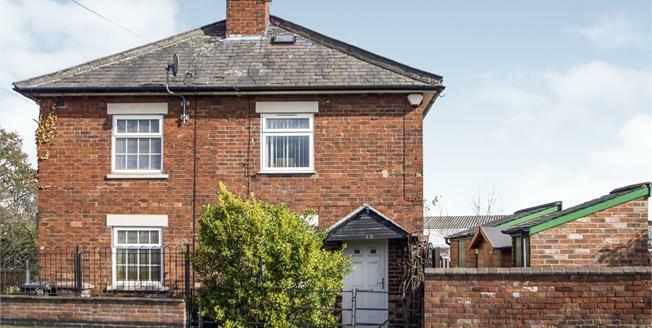 Frank Innes are delighted to bring to the market this traditional one bedroom semi-detached cottage providing a wealth of character. The property would suit somebody looking to downsize or first time buyers. It is well positioned for all local amenities and transport links. In brief the accommodation comprises of open plan lounge and kitchen to the ground floor. To the second floor is a double bedroom and bathroom with loft access. The loft space offers excellent storage. To the side of the property is a small garden. Double glazed uPVC door to the front, two double glazed uPVC windows facing the front and side, radiator, television point, exposed brick fireplace with multi fuel burning fire, original beams, laminate flooring. Roll edge work surface, built-in wall and base units with breakfast bar, one and a half bowl sink with drainer, space for freestanding oven and fridge/freezer, double glazed uPVC window facing the side, under stairs storage cupboard. Double glazed uPVC window facing the front, radiator, fitted wardrobes, laminate flooring. Low level WC, panelled bath with shower over the bath, wash hand basin, double glazed uPVC window facing the side, wall mounted boiler, loft access with pull down loft ladders. Loft room is used for storage with a skylight. To the side of the property is a small garden area.